An upright freezer is an essential appliance for most restaurants, grocery stores, fast food chains, and convenience stores, to name a few businesses. If you’re looking to lease a commercial upright freezer for the surrounding communities, talk to the commercial refrigeration equipment and upright freezer specialists here at Young’s Cooling and Leasing. We represent a wide range of high-quality upright freezer brands and can help you select exactly the right one to fit your operation and budget. 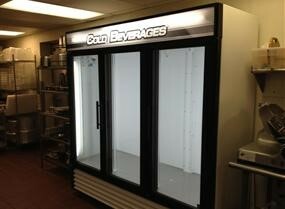 We even offer used upright freezers to help business owners and managers get the right equipment at the right price. In fact, we know the service history behind most of the used equipment we sell because we’ve been servicing it. If you own and operate a commercial upright freezer, it’s important for you to properly maintain it – not only for the safety of your customers, but because a well-maintained, efficient upright freezer can save you time and money. Upright freezers are a major investment for many businesses. That’s why it’s crucial to know how and when to have services for repairing and maintaining an upright freezer. Ignoring maintenance can easily add to your overhead, because emergency repairs can quickly become expensive. Also, routine care helps in regulating cash flow and profits because it reduces the chance of food products going bad. More importantly, regular upright commercial freezer check-ups help in cutting extra costs like unnecessarily high electricity bills and aid in increasing your upright freezer lifespan. To learn more about what we have to offer for leasing, servicing, and repairing a commercial upright freezer, contact us today here at Young’s Cooling and Leasing.